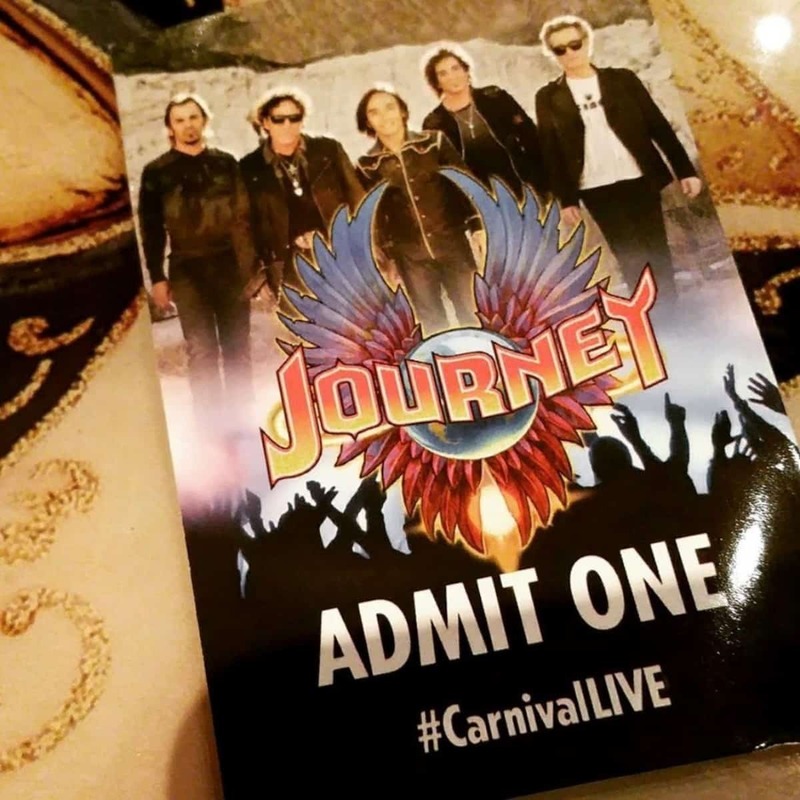 Our ticket to enter the Carnival LIVE Journey concert aboard Carnival Liberty. 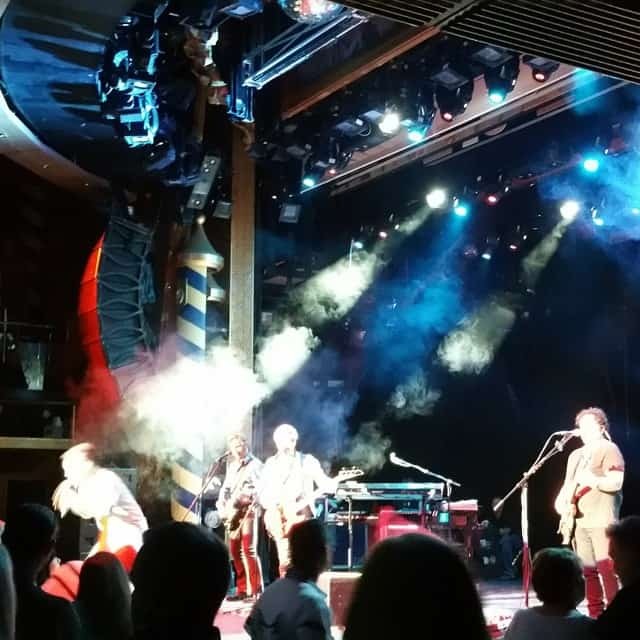 As the ship’s clock struck 9 p.m., the band Journey took to the stage aboard the Carnival Liberty, offering 1,300 lucky guests a once-in-a-lifetime Carnival LIVE experience. Beginning with songs “Any Way You Want It,” “Separate Ways (Worlds Apart)” and “Be Good To Yourself.” The band treated us to a set of sixteen legendary songs along with two guitar solos and a keyboard medley. A Journey fan for most of my life, being able to see them live in such a small venue was a bucket list moment. Frontman Arnel Pineda put on an amazing show filled with powerful vocals and unending energy. He ran and jumped to all corners of the Venetian Palace’s stage, reaching out to guests with high fives and interacting with them, making for a special experience. A highlight of the show was hearing Jonathan Cain tell the story how the song “Faithfully” was written on the road aboard a bus one night and recorded the next day. The song recounts the life of a “Music Man” with its circus atmosphere on the road. As one of my favorite songs, hearing this story followed by the song live with its subtle intro, followed by the thunderous drums and guitar was almost surreal. Neal Schon still has some hard feelings towards Steve Perry even after all these years. During the intro to “Lights,” he took a quick jab. He said “(Perry) says I only wrote 25 percent, but it wouldn’t sound this good with guitars if I only wrote 25 percent.” This surprised me since the the song was released in August 1978. One thing I enjoy most–next to cruise travel–is great live music. I’ve been to some amazing concerts in my life. Carnival LIVE offers the best of both worlds. It allows you to experience a great cruise vacation and have the option to see an amazing live show in an intimate setting for great price. You don’t have to drive to the arena, pay for parking, or sit on uncomfortable arena seats. Carnival LIVE shows take place in the ship’s main show lounges — which range in seating capacity from 900 to 1,300 – for an on-board performance where there is never a bad seat in the house. Your seats are comfortable, and you even have a place to hold your drink, which is delivered to you before the show begins. Ticket prices for 2015 range from $35 to $60 for general admission. VIP tickets are available for $125 to $250 and come with a seat in the first four rows, an artist meet and greet, a souvenir photo with the artist, and a commemorative concert pass. Unlike other concert cruises, these sailings are not group cruises or full charters where the price of the concert is included in the price. The cruises are priced just like other sailings but give you the option to see a Carnival LIVE concert while onboard. 1. Buy Tickets When Booking – Purchase your concert tickets when you book your cruise since tickets are limited. You can do this when you complete your initial check-in at Carnival.com and reach the step to purchase any optional tours and activities. Your Carnival LIVE sailing will have an extra line added (ie. Nassau – Little Big Town – BUY TICKETS) with an option to buy tickets if they are not sold out. 2. Get To Show Early – Once onboard your Carnival LIVE cruise, come to the show early to get the best seats. General Admission seats are not reserved, so you will need to show up early to get the best pick. You may also consider sitting in the upper level instead of the lower level. These seats may offer you an unobstructed view, even if someone stands up during the show. 3. Relax, You’re On A Cruise – You won’t have to drive to the arena or stadium. The need for a designated driver won’t be necessary. Don’t worry about the traffic jam leaving the show or having to get up for work in the morning. You’re on a cruise! Relax! When you leave the show, you’re only steps away from your cabin!